The Conservation Planning Atlas (CPA), developed by the Pacific Islands Climate Change Cooperative (PICCC), is an open access, web-mapping and science support platform to help our members with climate change adaptation planning. With the CPA you can search for, discover, explore and analyze conservation and climate change-focused spatial datasets. 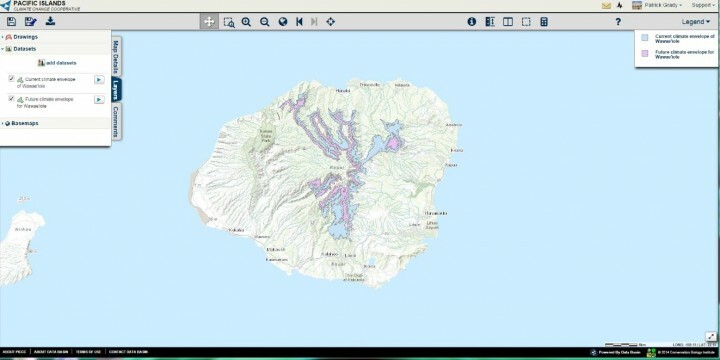 Casual and experienced GIS users can access a central resource for multiple agencies and organizations as well as visualize results of PICCC-supported projects. The CPA provides a convenient forum to collaborate on specific topics, create interactive maps, generate queries and reports, download data and publications, and learn more about landscape scale conservation science and design in the region. CPAs are powered by Data Basin and curated by a variety of Landscape Conservation Cooperatives and other conservation entities. They are customized to meet the needs of a target audience and showcase spatial information for a particular geography, topic, project or organization. The PICCC CPA will include relevant climate change and conservation datasets for the Pacific Islands region. Users can also discover and connect to any of the 15,000+ datasets found within the broader Data Basin catalog, which have a primary focus on conservation and the environment. They can also discover individuals and topic specific groups from the list of 10,000+ users located around the world. The PICCC CPA will complement, not compete with, existing tools, portals and data gateways. Useful data layers residing in portals such as the HCA’s ECP can easily be mapped across and made available for download and analysis within the CPA. Similarly, data layers from the CPA can be consumed by the ECP portal for user mapping and analysis purposes. The PICCC CPA homepage highlights project galleries, featured content such as maps and datasets and a home page map. 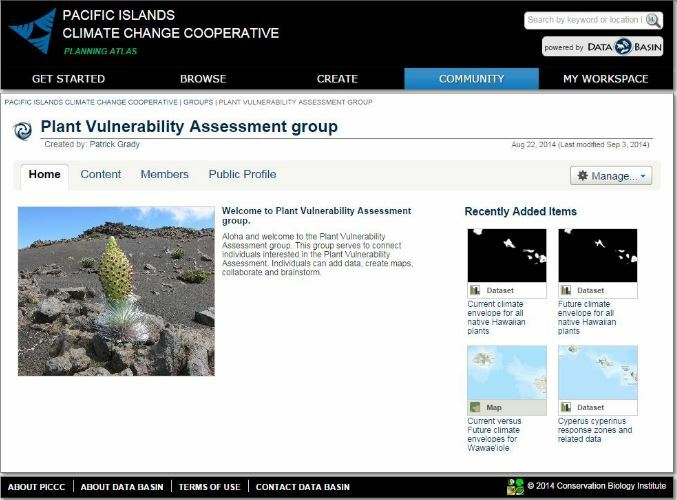 Users of the Atlas can become members of collaborative groups focused on specific issues, like the Plant Vulnerability Assessment group seen here. Within such groups, data sets and documents can be uploaded and shared, maps and other products developed collaboratively, and outputs for public use prepared. Only group members are allowed to work within the group space and see the projects being worked on. A primary goal of the CPA is to make climate-change related data sets available for wide use in conservation planning. In addition to downscaled climate data such as precipitation and temperature projections, we will host projected range maps for native Hawaiian plants (seen here for a species on Kaua’i) and forest birds, impacts of sea level rise on wetlands, coral reef stresses, and other indicators as they are developed and become available. Feedback from users on key information needs will be important in helping the PICCC prioritize data acquisition and research priorities. Curious to learn even more? Head over to the PICCC website’s Data page, or go directly to the CPA website at piccc.databasin.org to check it out for yourself. The PICCC will also have an exhibit at the Hawaiian Conservation Conference on August 5th, 2015, to provide demonstrations, answer questions, and assist with setting up new accounts!